Legendary dev, Shigeru Miyamoto, explains why Nintendo tends to stick with tried and tested IPs. It must take Mario weeks to fill out his CV. 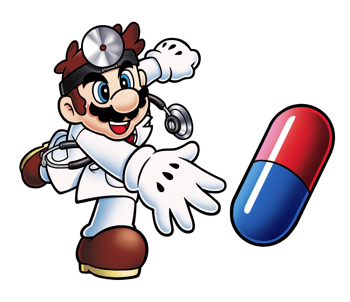 Among other things, he's a plumber, a professional go-kart racer, a martial artist, an accomplished golfer and, even though I question his over-reliance on antibiotics as a method of treatment, a licensed doctor. His perpetual presence on game covers is partially down to his expertly charming design, but it's also somewhat of a self-fulfilling prophecy. Nintendo makes games about Mario because he's popular; he's popular because he's in so many great games. Money obviously plays a part in his seeming omnipresence, but there's also the design philosophy of legendary developer and gaming trendsetter, Shigeru Miyamoto, to consider. As he reiterated in a recent interview with Polygon, Miyamoto's design philosophy begins with an almost exclusive focus on gameplay, as opposed to narrative, character design or branding. "From my perspective," he explained, "we approach it not from, 'What is the next character?' But really, 'What is there within this structure of video games or this sphere of video games, from which we can create new play structures?' and 'How can we develop these new types of play structures and new types of games and deliver those to consumers in a way that will be satisfying for them?' In some cases it may be that those new structures will use existing franchises. So we're focused more on the play and the interaction rather than necessarily on a specific character as the IP." The statement echoes one he made to Time Magazine back in 2007. "I try not so much to create new characters and worlds but to create new game-play experiences," he explained. "If a new experience is better suited to a new type of character or world than one of our existing franchises, then we might create a new character or world around it." Want a concrete example of how effective this approach can be? When Miyamoto sat down to design what would eventually become The Legend of Zelda - arguably one of the most influential games of all time - he didn't have a green-clad, pointy-eared classical hero figure in mind. The earliest design document for Zelda was found in a binder labeled, "Adventure Mario." Yeah, think on that for a moment.